Note: There are thousands of species of maple trees in the world—we cannot easily identify maple species over the phone or via email. There are two great websites that can help, though: Virgina Tech, and Maple-trees.com. The following is used with the gracious permission of Ohio State University. 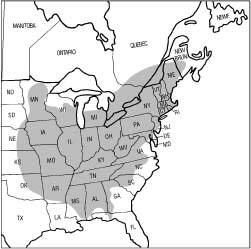 The commercial production of maple products in North America occurs primarily in the northeastern United States and southeastern Canada (Figure 3.1). This is the geographic area of greatest abundance of sugar maple (Acer saccharum) and black maple (Acer nigrum), the two most preferred and most commonly tapped maple species. There are thirteen native maple species in North America (Table 3-1). While most of these species are probably tapped to some extent, at least by hobbyists, sugar and black maple, along with red maple (Acer rubrum), provide most of the commercial sap. A fourth maple species, silver maple (Acer saccharinum), is sometimes tapped, particularly in roadside operations, and is often confused with red maple. Table 3.1. Maple species native to the United States. Table 3.2 contains a descriptive comparison and Figures 3.2 through 3.5 illustrate characteristic leaves, bark, twigs, and fruits of sugar, black, red and silver maple. These four species share several characteristics in common. 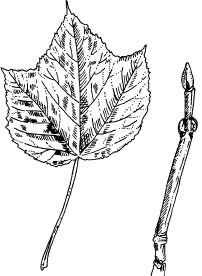 All have leaves of similar shape: a single leaf blade with the characteristic maple shape, 3-5 lobes radiating out like fingers from the palm of a hand (palmately lobed) with notches (called sinuses) between the lobes. Like all maples, the leaves, buds and twigs of all four are attached in pairs opposite each other along the branches. Also, all four produce a fruit called a samara (or double samara), which is a pair of connected, winged seeds. Table 3.2. Identifying Characteristics of Sugar, Black, Red and Silver Maple. Sugar Maple 3-5 inches wide; 5lobed (rarely 3-lobed); bright green upper surface and a paler green lower surface; leaf margin without fine teeth (compare with red and silver maple). Young trees up to 4-8 inches with smooth gray bark. Older trees developing furrows and ultimately long, irregular, thick vertical plates that appear to peal from the trunk in a vertical direction. A somewhat shiny, brownish, slender, relatively smooth twig with 1/4–3/8 inch long sharply pointed terminal bud. Horseshoe-shaped double-winged fruit with parallel or slightly divergent wings. Winged seed approximately 1″ long. Fruits mature in fall. Black Maple Similar to sugar maple but usually 3-lobed (sometimes five); often appears to be drooping; often with a thicker leaf and lear stem (petiole) than sugar maple; usually with two winglike or leaflike growths at the base of the petiole (stipules). Similar to sugar maple but usually darker and more deeply grooved or furrowed. Similar to sugar maple but twig surface with small warty growths (lenticels, which are not raised much above the bark surface in sugar maple) and often more hairy buds. Similar to sugar maple with, perhaps, a slightly larger seed. underside. Young trees up to 4-8 inches with a smooth light gray bark, developing into gray or black ridges and ultimately narrow scaly plates. Slender, shiny, usually reddish in color; terminal buds 1/8–1/4 inch long, blunt, red; odorless if bark bruised or scraped. V-shaped, double-winged fruit about 1/2-1 inch long. Fruit matures in spring. Silver Maple 5-7 inches wide; deeply clefted; 5-lobed with the sides of the terminal lobe diverging toward the tip; light green upper surface and a silvery white underside; leaf margin with fine teeth (but not the inner edges of the sinuses). Silvery gray on young trees breaking into long thin scaly plates that give the trunks of older trees a very shaggy appearance. Considerable red is seen in bark pattern as scales develop. Similar to red maple but bruised or scraped bark has a very fetid or foul odor. V-shaped, double-winged fruit 11/2 to 2 inches long, with widely divergent wings. One of two seeds present is often poorly developed or aborted. Fruit matures in spring. Figure 3.1. Area of commercial maple syrup production in North America. Figure 3.2. Sugar maple bark, fruit, leaf, and twig. Figure 3.3. Black maple bark, fruit, leaf, and twig. Figure 3.4. Red maple bark, fruit, leaf, and twig. Figure 3.5. Silver maple bark, fruit, leaf, and twig. Sugar and black maple are very similar species and unquestionably the most preferred species for producing maple products, primarily because of their high sugar content. Sugar maple occurs naturally throughout most of the northeastern United States and southeastern Canada (Figure 3.6). Black maple, on the other hand, occupies a much smaller natural range (Figure 3.7). Distinguishing between them may be more of an academic exercise than one useful in sugarbush management because (1) they are essentially identical in quality as sugartrees, and (2) they often hybridize producing trees with a range of characteristics, making it difficult to clearly distinguish between them. 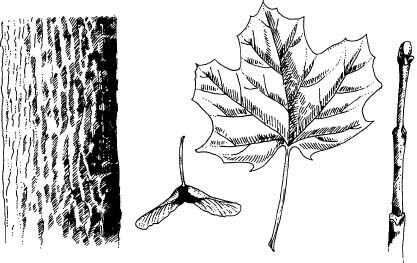 Identifying a tree as a sugar or black maple (Table 3.2, Figure 3.2 & 3.3) is easily done from the leaves by observing 5-lobed leaves, the paired opposite attachment of the leaves along the stem and the lack of teeth along the leaf margin; from the bark of older trees by observing the long plates that remain attached on one side; from the twigs by observing the opposite arrangement of buds and the relatively long, pointed, brownish terminal bud; and from the seed by observing its horseshoe shape and size. 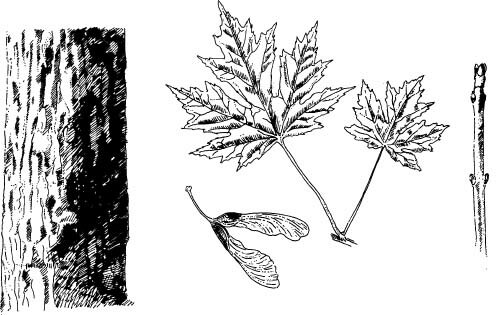 Distinguishing between sugar and black maple is best done by comparing the leaf structure (particularly the number of lobes, droopiness and presence or absence of stipules along base of petiole) and by the degree of bumpiness of the twigs. Sugar and black maples are found on a variety of soils and site conditions, but neither tolerates excessively wet or dry sites, and both grow best on moist, deep, well-drained soils. Black maple is more likely to be found along moist river bottoms. Both species can be found growing in pure stands, with each other, or with a wide variety of other hardwood species including American beech, American basswood, yellow birch, black cherry, northern red oak, yellow poplar and black walnut. Both species have been planted extensively as roadside trees which are often tapped as part of a sugaring operation. Plantations of sugar maple have also been established with the intent of developing efficient, productive sugarbushes. Both species are relatively long lived, capable of living well beyond 200 years, with trunk diameters greater than 30 inches and heights greater than 100 feet. Sugar and black maple both grow in the shade of other trees (they are shade tolerant), and trees of many different ages (sizes) are often found in a forest. Both species are also found in stands composed of trees that are essentially all the same age (size). Healthy sugar and black maple trees growing in overstocked uneven-aged or even-aged stands can be expected to achieve tapable size in 40 to 60 years, depending on overall site quality. Thinning or release cutting dramatically reduces this age-to-tapable-size. Sugar and black maple are particularly attractive as sugartrees because of their high sap sugar content and the late date at which they begin growth in the spring. Sugar and black maple have the highest sap sugar content of any of the native maples. While the exact sap sugar content of a tree will vary depending on many factors including genetics, site and weather, sugar and black maples generally average between 2.0 and 2.5 percent sap sugar content. It is not unusual to find many trees in a sugarbush well in excess of 3 percent, and occasionally higher. Genetic research on sugar maple suggests that the sap sugar content of planted seedlings can be increased by controlled breeding. Other things being equal, higher sap sugar content translates to lower costs of production and greater profits. Black and sugar maples begin growth later in the spring than red or silver maple. As maples begin their growth, chemical changes occur in the sap which make it unsuitable for syrup production. The term “buddy sap” is often applied to late season sap which produces syrup with a very disagreeable flavor and odor. 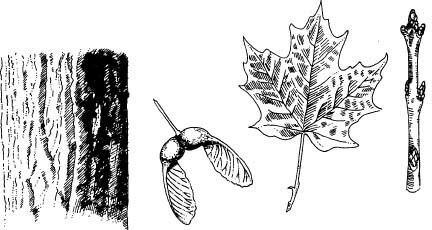 Because sugar and black maple resume growth later than red or silver maple, sap may be collected later in the spring. Red maple is commonly tapped in certain geographic areas, particularly in the southern and western portions of the commercial maple range. 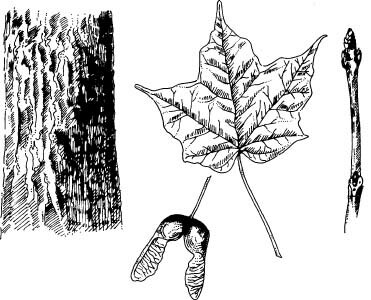 Identifying a tree as a red maple (Table 3.2, Figure 3.4) is done from the leaves by observing the 3 lobes (occasionally 5), the paired opposite arrangement of the leaves and the small teeth along the margin; from the bark of older trees by the presence of the scaly plates; from the twig by observing the pairedopposite arrangement of the buds, the relatively short, blunt, rounded, red terminal bud and the lack of an offensive odor when the bark of the twig is bruised or scraped; and from the fruit by observing its severe V-shape and size. Red maple is one of the most abundant and widespread hardwood trees in North America (Figure 3.8). Probably no other species of forest tree, certainly no hardwood, can thrive on a wider variety of soil types and sites. Although it develops best on moderately well-drained to well-drained, moist soils, it commonly grows in conditions ranging from dry ridges to swamps. Because of the wide variety of sites on which red maple will grow, it is found growing naturally in pure stands and with an enormous variety of other tree species ranging from gray birch and paper birch, to yellow poplar and black cherry, and including sugar and black maple. Its rapid growth and ability to thrive on a wide variety of sites have resulted in its widespread planting as ornamental and street trees which are often tapped as part of a sugaring operation. Compared to sugar and black maple, red maple is a relatively short-lived tree, rarely living longer than 150 years. Mature trees commonly average between 20 and 30 inches in diameter and 60 and 90 feet tall. Like sugar and black maple, red maple is shade tolerant and is found in both even-aged and uneven-aged forests. Thinning or release cutting will substantially shorten the age-to-tapable-size. From the perspective of producing maple syrup, red maple’s most attractive characteristic is its ability to thrive on a wide variety of site conditions. In some areas of the commercial maple range, red maple is the only maple present on many sites. One either taps red maple or they don’t sugar. In other areas, red maple may be tapped along with sugar and black maples. It is important to emphasize that good, high-quality maple syrup can be made from red maple sap. However, for sugaring, red maple does have three important weaknesses. First, the sap sugar content of red maple will be less, on the average, than that of nearby comparable sugar or black maples, perhaps by 1/2 percent or more. This lower sap sugar content translates to higher costs of production and lower profits. Secondly, red maple begins growth in the spring before sugar and black maples, resulting in a shorter collecting season. In addition, when the sap of some red maples is processed, an excessive amount of sugar sand is produced. Sugar sand or niter is the salt that precipitates during the evaporation process. Sugar sand can cause several problems during the production process. Silver maple is a rapidly growing maple found throughout much of the eastern United States and extreme southeastern Canada, where it is often tapped (sometimes heavily) in a particular location (Figure 3.9). Throughout much of the commercial maple region, however, most maple producers will not tap silver maple. 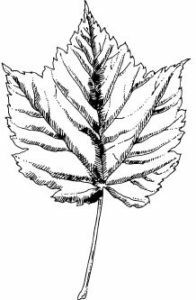 Identifying a silver maple (Table 3.2, Figure 3.5) is done from the leaves by observing the 5 lobes with the sides of the terminal lobe diverging toward the tip, the paired opposite arrangement of the leaves, the presence of fine teeth along the margin but not on the inner sides of the sinuses and the silvery white underside; from the bark of older trees by the trunk’s shaggy appearance; from the twigs by observing the paired opposite arrangement of the buds, the relatively short blunt, rounded, red terminal bud and the presence of a fetid or foul odor when the twig is bruised or scraped; and from the fruit by observing its V-shape and size. Under natural conditions, silver maple is primarily a bottomland and floodplain species, where it may occur in pure stands but is more commonly found associated with other bottom species such as American elm, sweetgum, pin oak, swamp white oak, eastern cottonwood, sycamore, and/or green ash. Silver maple is among the fastest growing hardwood species commonly planted in eastern North America, certainly the fastest growing maple. For this reason, it has been widely planted as an ornamental and street tree. Its use as an ornamental and street tree, at least in urban areas, has been discontinued in recent years because the wood of silver maple is very brittle and often breaks in severe wind, snow or ice storms. Nevertheless, large silver maple street trees are numerous in many areas and these are sometimes tapped as part of a sugaring operation. Like the red maple, silver maple is a relatively short-lived tree when compared to the sugar or black maple, living perhaps 130-150 years. Because of its fast growth rate, however, mature trees can achieve diameters in excess of 3 feet and heights in excess of 100 feet. On good sites with little competition from other trees, silver maple diameter growth may approach 1/2 inch per year (rates as high as 1 inch per year have been recorded). Silver maple’s growth rate often responds dramatically to thinning or release cutting. When compared to sugar, black and red maple, silver maple is a distinctly fourth choice for sugaring for several reasons. First, its sugar content is usually lower than red maple’s, perhaps as much as 1/2 percent or more, which means even higher production costs and lower profits. Second, like red maple, it begins growth in the spring, earlier than sugar and black maple, resulting in a shorter collecting season. Third, like red maple, the evaporation of sap from some silver maples produces an excessive amount of sugar sand. 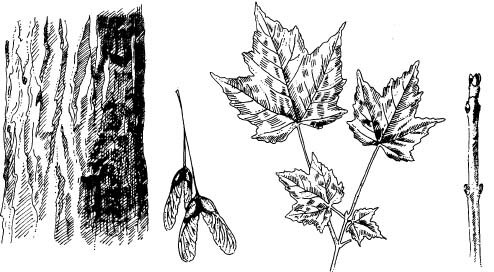 Striped maple (Acer pensylvanicum) and mountain maple (Acer spicatum) are two other native maples that are found growing within the commercial maple range (Figures 3.10 and 3.11). Neither of these species is commonly tapped. Striped maple is a small slender tree which rarely attains tapable size. It is most easily identified by the opposite paired arrangement of its leaves and branches, its 3-lobed leaf with fine teeth on the margin, and striping on the branches and young trunks. Mountain maple is essentially a shrub. It is most easily identified by the opposite paired arrangement of its leaves and branches and its 3lobed leaf with coarse teeth. If these species occur in a sugarbush it is important to be able to identify them. They should not be confused with the desirable maple species when performing management practices such as thinning or release cuts. One exotic maple, Norway maple (Acer platanoides), is commonly planted as an ornamental and street tree and will attain tapable size. It is recognized by the opposite paired arrangements of its leaves and branches, its 7lobed leaf without marginal teeth, and its 11/2 to 2 inch long samara with divergent wings (Figure 3.12). The sap of Norway maple is not commonly used to produce maple syrup. Figure 3.6. 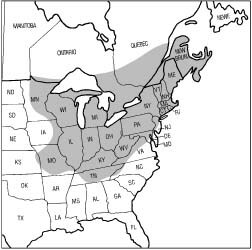 Geographic range of sugar maple in North America. Figure 3.7. 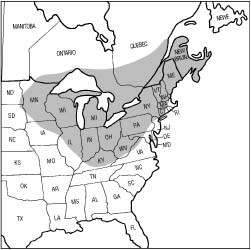 Geographic range of black maple in North America. Figure 3.8. Geographic range of red maple in North America. Figure 3.9. 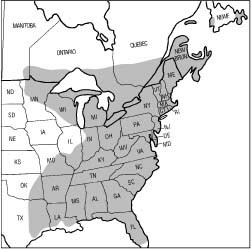 Geographic range of silver maple in North America. and North American Trees, by Richard J. Preston Jr. Figure 3.11. Mountain maple leaf. Figure 3.12. Norway maple bark, fruit, leaf, and twig.